What a great time of year for a rejuvenating forest walk! Andrea Prazmowski at Forest Therapy Ottawa leads Forest Wellness Walks in and around Ottawa-Gatineau. These gentle walks provide an opportunity to slow down, take time to experience nature and be mindful of the wonder and life around us. 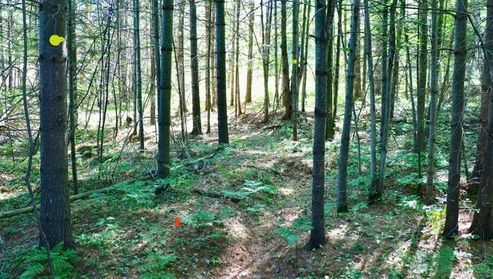 Thanksgiving Forest Walk at Morris Island Conservation Area, on Sunday, Oct. 7, 2018 from 10 a.m.-2:30 p.m.
Wednesday Wellness Walks at Stony Swamp, on Wednesday Oct. 10, 17 or 24, 9:30 a.m.-noon. Crazy Horse Trail in the Carp Hills on Saturday, Oct. 13, 1-3:30 p.m.
See.Breathe.Be Forest Walks at Gaia Wellness Retreat, Gatineau Hills, on Sunday, Oct. 14 and Sunday, Oct. 21, 3-5:30 p.m.
Old-Growth Pines, Gillies Grove National Historic Site (home of the tallest living tree in Ontario!) in Arnprior, on Tuesday, Oct. 16, 9:30 a.m.-noon. Some walks are on accessible trails, have flexible pricing and/or support local environmental groups. Check the Forest Therapy Ottawa website for further details and registration links. Spending time in nature can reduce stress, improve physical and mental wellness, promote energy and attention capacity, and enhance happiness and creativity. Among the many good reasons to go on a forest walk very soon. For more forest time in fall colours, visit one of the many trails in the Ottawa-Gatineau area, for example in Gatineau Park or the Greenbelt, where the NCC’s Fall Rhapsody is on from Sept. 29 to Oct. 21, 2018, or in natural areas managed by the City of Ottawa. The storm last Friday was a grim reminder of the precariousness of Ottawa’s built and natural environments—including the area’s tree canopy. A coalition of community groups has organized a series of local events to mark National Tree Week, September 23-29, 2018, and to draw attention to the importance of trees and their habitats. Those events are ongoing, and perhaps all the more significant now. 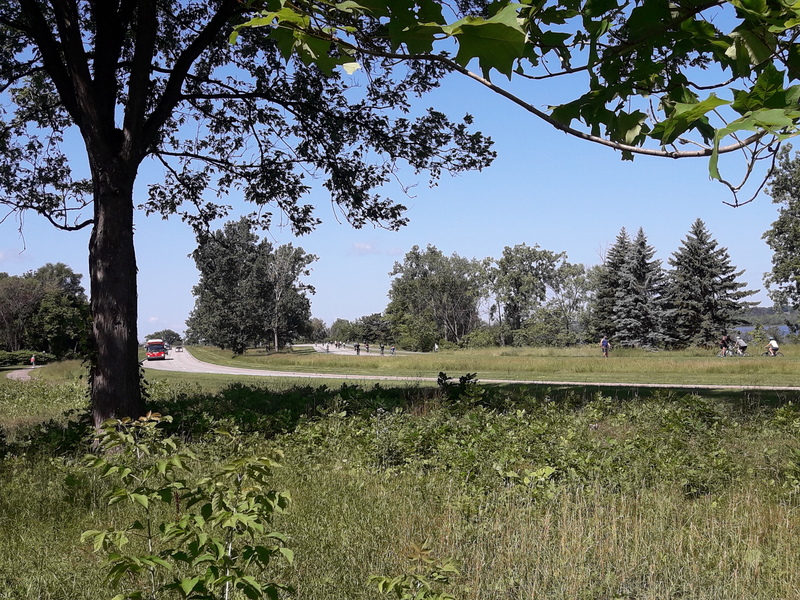 One of the purposes of the week’s activities is to connect tree protection to Ottawa’s election. Ottawa’s trees are threatened not only by extreme weather, exacerbated by climate change, but by infill and urban development, disease and other factors. The intention is to convey the message to municipal officials and administrations that they need to lead the preservation and promotion of local trees and the green spaces and infrastructure that enable trees to flourish. 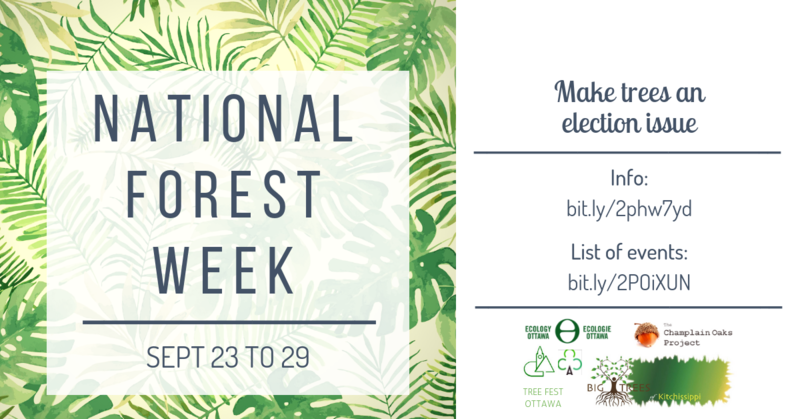 Everyone is invited to participate in the week’s activities, which started with Tree Fest Ottawa’s Fall Tree Festival last weekend. Upcoming events include tree planting by students on National Tree Day, Wednesday Sept. 26, and the Canadian premiere of India’s Healing Forests film on Thursday, Sept. 27. The campaign invites citizens and community groups to host discussions or events, and engage municipal candidates, during National Tree Week. Suggested types of activities include tree-planting, storytelling, tree walks, or meetings with ward candidates. See Ecology Ottawa’s page or Tree Action Now’s site for further information. Thinking of everyone affected by the three six tornados and storm that thundered through the Ottawa-Gatineau area on Friday. Grateful for the people who have worked through the aftermath of the storm, to look after others, respond to emergencies, assess and address the damage, share shelter, food and water, and keep lines of communication open. Here at home, our power outage and disruption of internet and phone service were inconvenient but manageable thanks to camping equipment, kind friends and a bit of gear (e.g. wind-up radio) that runs on human or solar power. All a reminder of the fragility of our built-up existence on this intricate planet, and our interdependence with its systems—and each other. 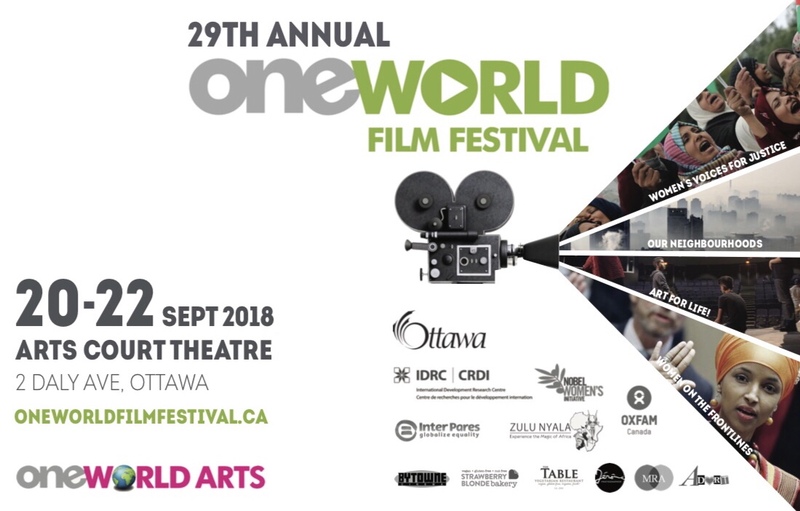 The annual One World Film Festival in Ottawa is on from Thursday, Sept. 20-Saturday, Sept. 22, 2018, with a bonus film on Thursday, Sept. 27. The Festival is jam-packed with documentary films from around the world on environmental, social justice and human rights topics. The Wapikoni Indigenous short films program on Saturday, Sept. 22 at 1:30 p.m.
There’s also a post-festival screening of Anote’s Ark (Canada 2018), on climate change, rising oceans and people’s actions on Thursday, Sept. 27 at 6:45 p.m.
See the One World Film Festival website for details. Guest post contributed by Christine Earnshaw, Tree Fest Ottawa. 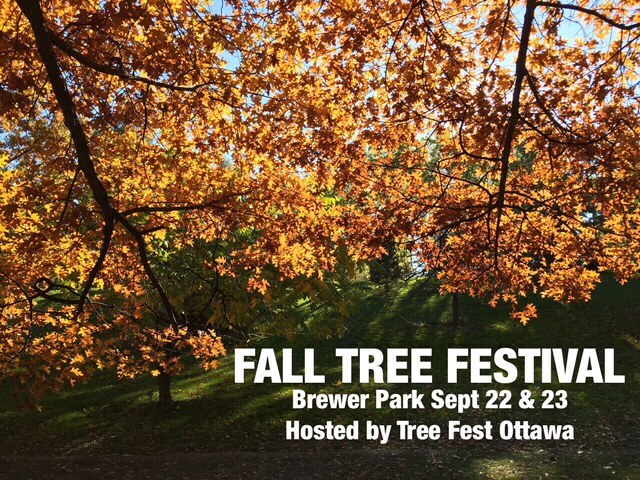 On Saturday and Sunday, September 22nd and 23rd, 2018, from 9:30am – 4:30pm, Tree Fest Ottawa presents its fall tree festival at the south end of Brewer Park near Brewer Pond. This outdoor festival combines learning + nature + art + play. Connect with trees and your community in this little oasis of nature in the city. Free admission through the support of the City of Ottawa. Visit Tree Fest Ottawa’s website for the Festival Program. The municipal election is still a couple of months away (Oct. 22), but it’s time to be hearing from candidates about their plans for a greener Ottawa. Ecology Ottawa has a useful tool to help understand candidates’ positions on environmental issues. They’re doing a survey of mayoral and councillor candidates about their plans for climate change action and an active and green city, and are posting the answers. So far more than 50 candidates have answered the questionnaire, but more than 60 have yet to reply. You can help by contacting the candidates to ask them to make their views known by Friday Aug. 10. There are additional questions that candidates need to be asked—about plans for cleaner rivers, and for restoring Chaudiere Falls and the islands, for example—but the survey covers a wide range of important issues. See more about Ecology Ottawa’s municipal election campaign on their website. The recent heat wave is a reminder that climate change is contributing to more extreme weather events here in Ottawa as well as around the world. All the more reason to focus on sustainable energy alternatives. With the federal government’s subsidy of the Kinder Morgan pipeline, and the Ontario government pulling the plug on cap and trade and the green energy programs it funded, getting to sustainability is going to require a lot of people power. Ecology Ottawa, 350.org and the Council of Canadians are hosting a community town hall on Canada’s investment in the Kinder Morgan pipeline. The event includes a discussion and a screening of Directly Affected: A Pipeline Under Pressure, a short film by B.C. filmmakers. 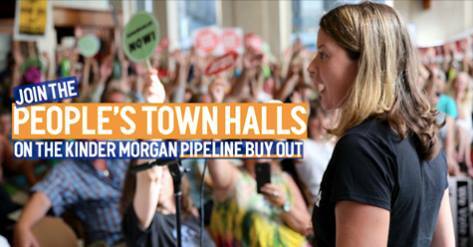 The town hall takes place at the Ottawa Public Library Main branch auditorium on Wednesday, Jul. 11, 2018 at 7 p.m. See the Facebook page for details. Directly Affected: Pipeline Under Pressure from Directly Affected on Vimeo.